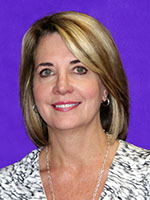 Dr. Laura S. Bonanno is an Associate Professor of Clinical Nursing at Louisiana State University Health Sciences Center School of Nursing. She received a Bachelor of Science in Nursing from Southeastern Louisiana University, a Master of Science from Charity Hospital/Xavier University School of Nurse Anesthesiology, and a Doctor of Nursing Practice from the University of Tennessee Health Sciences Center in Memphis. Dr. Bonanno is currently pursuing a PhD in Higher Education Administration at the University of New Orleans. Dr. Bonanno is a Certified Registered Nurse Anesthetist. She is the program director for the School of Nursing’s Nurse Anesthesia Program and serves as a course coordinator for nurse anesthesia courses, faculty advisor, and MP for SIP projects. Dr. Bonanno is a part-time staff CRNA and clinical instructor at the Medical Center of Louisiana. Dr. Bonanno serves on the editorial board of The International Journal of Student Nurse Anesthetists and as an appointed board member to the Louisiana State Board of Nursing. Dr. Bonanno has experience in the administration of general anesthesia and monitored anesthesia care for general surgery, ENT, thoracic, cardiac, vascular, pediatric, neuro, trauma, orthopedic, oral surgery, special procedures, plastic surgery, GU and OB cases on all ASA classifications. She participates in yearly medical/surgical mission trips to Guatemala. Dr. Bonanno’s research interest and publication areas include IPE, Clinical Evaluation, and Faculty Instructor. She has received the LSU Anesthesia Department’s Excellence in Teaching Award and was named one of the Great 100 Nurses of Louisiana. Dr. Bonanno has also been recognized by the National Scholars Honor Society and the Golden Key International Honour Society, and Phi Kappa Phi.